Sage and coyotes: Some people think you only find them out West. Naw (Maine tawk for "no")! That isn't true. You'll find a variety of sages growing in New England gardens, even way north. Also, if you look up the street or in the local park at the right time of day, you might spot Canis latrans -- the Eastern coyote -- which is thriving in cities and suburbs, as well as the countryside, throughout the Northeast. Ayuh, (Mainian for "yes")! this isn't really a story about coyotes. What we're barking about is this: Break away from stereotypes, and you may be surprised by what you see in unexpected places. For example, online, we stumbled across a native Texas sage in a botanic garden on the coast of Maine. Well, yee hah, which is Texan for a fist-pumping "Yes!" Most plants called sage are in the Salvia genus, which encompasses about 1000 species. Our Northern California farm, Flowers by the Sea, raises hundreds of types -- including many northeastern favorites -- for sale through our online plant nursery. Getting Started is a series of articles intended to help gardeners new to the Salvia genus. Success in cultivating sages is partly based on selecting types that are appropriate for regional growing conditions. For this article, we define New England as the traditional six-state region: Maine, Vermont, New Hampshire, Massachusetts, Connecticut and Rhode Island. However, in researching different regions of the nation, we've discovered that boundaries sometimes overlap. For example, due to its chilly climate similar to that of Vermont, the northern part of New York State often is considered part of the Northeast. Other times, it's referred to as being in the Mid-Atlantic region, which is where we placed it in this series. Nevertheless, if you live in upstate New York or another chilly winter locale, you may find this article's Salvia suggestions helpful. Coyotes wandered into the Northeast around 1930, according to the Maine Department of Inland Fisheries and Wildlife. They arrived in Massachusetts by 1950, the online publication MassLive says, and now number about 10,000 living in rural, suburban and urban areas. So when did sages sneak into New England? There is no clear answer, because there are so many types. You'll find a number of these mostly easy-to-grow plants -- some cold-tolerant perennials and others grown as annuals -- in backyards, botanic gardens and public areas throughout New England. 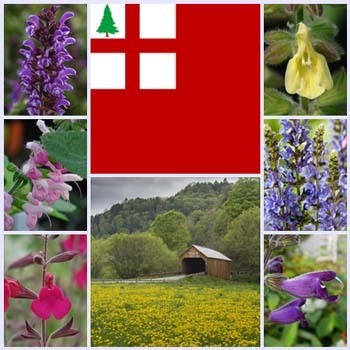 The New England Wild Flower Society notes that Lyreleaf Sage (Salvia lyrata) is the region's only native sage. It's one among many Salvia species grown in the Botanic Garden of Smith College in Northampton, Massachusetts, which has one of the largest collections of sage in the region (see the section "Discoveries at Botanic Gardens"). European Meadow Sages (S. nemorosa and S. pratensis) Zones 3 to 9, depending on variety. Red Veined Sage (S. haematodes -- a type of S. pratensis) is a cold-tolerant meadow sage that likely would do well in New England. However, before talking more about Salvias suitable for the region, it's helpful to consider New England's growing conditions, including winter temperatures, soil and precipitation. The U.S. Department of Agriculture divides the nation into 13 winter cold hardiness zones based on historical data concerning average winter minimum temperatures. Each zone is further divided into two subzones. Here's an explanation of the USDA zone map. The lower your zone number, the colder your winter temperatures with each zone separated by a ten-degree increment. New England zones range from 3b (a winter low of -35 degrees F occurring in parts of Maine, New Hampshire and Vermont) to 7a (a balmy 0 degrees F along the coast in Connecticut, Massachusetts and Rhode Island). Cold hardiness zones guide you in selecting plants that are perennial in your area. New England has a reputation for rocky, acidic soil much the same as the Southwest is characterized as having gravelly, alkaline soil. However, soil conditions can vary even within a neighborhood, so you shouldn't assume acidity. It's helpful to get a soil test through a local agricultural extension office at a state land grant university or an independent lab. Acidity and alkalinity refer to pH, the chemistry of soil, which is rated on a scale in which 7 is neutral (perfectly balanced). Lower numbers are acidic and higher numbers are alkaline. Garden loam is about 6.5. Some Salvias, such as ones from semi-arid regions, thrive on salty, alkaline soils. Others, including woodland species such as Meadow Sages, are good at handling acidity. Overall, many Salvias are adaptable to a wide range of soils, but we don't recommend desert species for the mostly moist and acidic Northeast. New England generally has plenty of precipitation, according to records kept by the National Oceanic and Atmospheric Administration. NOAA overview maps are good for comparing annual precipitation in different parts of the nation and for identifying drought patterns over a number of years. The 2012 map shows that year as a benchmark for drought nationwide, including the Northeast. Evidence of current low-level drought in some parts of New England is apparent in the week-by-week, interactive maps of the U.S. Drought Monitor. It is a joint project of the USDA, NOAA and the National Drought Mitigation Center at the University of Nebraska, Lincoln. The Northeast map for mid-April 2015 is splotched with yellow, which is the color used to signify areas affected by "abnormally dry" conditions -- the lowest level of drought. Click on Maine, and you discover that nearly 66% of the state was unexpectedly dry as of mid-April 2015 versus only about 9% a year earlier. At the same time, historically normal conditions existed in Connecticut, Rhode Island and most of Massachusetts while dry conditions pervaded nearly 83% of Vermont (about 9% on the same date in 2014) and 63 percent of New Hampshire (about 3% a year earlier). Of course, these figures and maps change week by week. Many Salvias are adaptable to swings between high and low moisture. They get by on less water and still look pretty when shortages occur. Public gardens are good venues for viewing plant performance and asking questions of expert staff. Two examples in New England are Coastal Maine Botanical Gardens (CMBG) and the Botanic Garden of Smith College. CMBG is located in Boothbay, which is in Zone 6 on the southern end of the coast. It grows a variety of cold-hardy Salvias, including Pink Makino (S. glabrescens 'Momobana' - a Japanese native hardy to zone 9) and Raspberry Delight Autumn Sage (S. greggii 'Raspberry Delight' - a Texas native hardy to zone 6). Sages are particularly popular in Amherst, Massachusetts. This is partly due to the work of Salvia specialist and retired chemist Dr. Richard Dufresne, who sold many at the local farmer's market during his years of post-doctoral studies at local universities and networked with other growers around the region, including Smith College. Northampton is close by, so Smith College is part of the Amherst community of sage gardeners. It's also part of the FBTS community, because it’s the source of our dusty blue-flowered hybrid Smith College Mystery Sage (Salvia sp. from Smith College). Cold hardy to Zone 9, this sage without a true scientific name must have come from the moderate climate of the school's Lyman Conservatory, because Northampton is in Zone 6. It would, however, be a good annual in New England. Arrowleaf Sage (S. sagittata) Zones 8-11. Many sages that are perennial in areas with moderate winter temperatures -- such as varieties of Anise-Scented Sage -- are popular as annuals where winters are chilly. Big Pitcher Sage (S. pitcheri grandiflora or S. azurea grandiflora) Zones 4-9, an American native. One way to search for cold-hardy sages in the FBTS online catalog is with the photo-illustrated FBTS Salvia Finder, which provides filters for sorting plants by preferences and growing conditions. Perhaps you've also read the Downeast publication that showed polar bears drifting on chunks of ice through Maine's Acadian National Park on Mount Desert Island. Naw! Not true. It was just a bunch of Photoshop phooey published on April Fools' Day. As to coyotes on the island? Ayuh. But the question of how they got there is much too perplexing to pursue in an article about gardening. We'd be glad, however, to help you with any perplexing matters about growing Salvias in New England or other places with chilly winters. Just call or send us an email. We get a bit crazy at this time of year, but we don't bay, yip or bite.